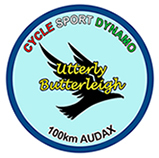 104km cycling event starting from Budleigh Salterton, Devon. Controls at Tiverton and Honiton, plus 2 information controls. Postcode for start is EX9 6RJ if you're having trouble locating it.